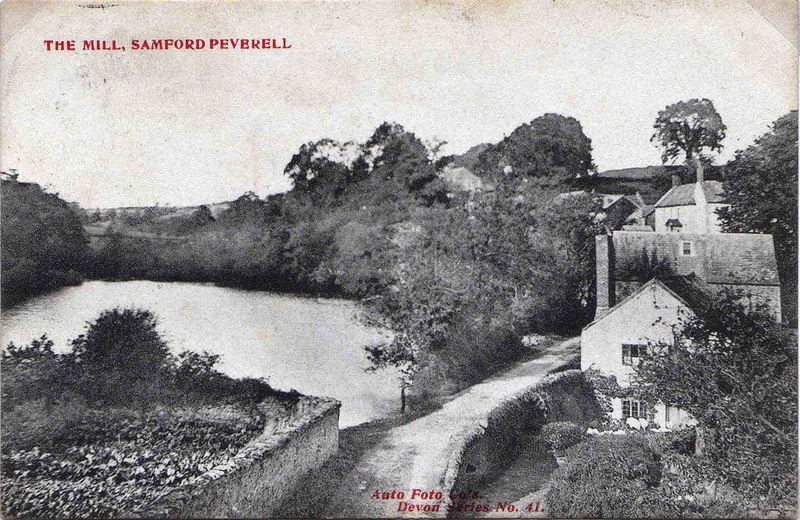 There is a huge amount of information about the history of the village, including maps and old photos, and transcriptions of records, on the website of the Sampford Peverell Society. The following is from the MDDC with input from the Sampford Peverell Society. Whilst there is no evidence of prehistoric sites within the village, the find of two prehistoric axes indicates prehistoric activity in the vicinity. There is also aerial photographic evidence and finds of flint tools demonstrating a concentration of prehistoric and Romano British activity in the Lowman valley. Roman coins have also been found near the village. In Saxon times, Sampford Peverell lands were held by a thane or feudal lord. A pre-conquest settlement was clearly in existence at this time as it was recorded as Sanforda in the Domesday survey, probably referring to a river crossing at a sandy ford. The origins of the settlement appear to be around a road linking Tiverton with Wellington where this crossed the river at Higher Town. There is a field boundary running north from the village up Connigar Hill, that is believed to be the dyke referred to in a Saxon estate charter dated AD 958. The name connigar is likely to be a reference to a medieval rabbit warren, “coni” being a Middle English word for rabbit. The same Saxon estate charter, setting out the estate boundary appears to describe the Brooks Ford as the start of that boundary. In the 12th century the manor was granted to William Peverell and this family name was added to the place name to give Sampford Peverell. In the medieval period, the parish church of St John the Baptist was built and was consecrated in 1259. It was built on the site of an earlier Saxon or Norman church, of which all that remains is the Norman font. The church retains a significant amount of the 13th century fabric in the nave and chancel. A monument within the church is believed to be of Sir Hugh Peverell, one of the church’s patrons in the 13th century. The south aisle and porch were added in 1498 by the generosity of Lady Margaret Beaufort, mother of Henry VII. There is evidence that Sampford Peverell was a borough in a 14th century document recording 28 free burgesses in the village. In addition there was a 2 day annual fair and a weekly market. Fairs and markets continued to be regular events in the village until the early 20th century. Sampford Peverell had a castle or at least a castellated mansion built about 1337 and referred to as Sampford Castle. Its exact location is unknown but earthworks north of Sampford Barton may be the remains of this structure. There is also some evidence of either a possible moat or fish ponds. Apart from the church dating from the 13th century, the oldest building in Sampford Peverell is the Old Rectory that dates from the early 16th century, also built for Margaret Beaufort, mother of Henry VII and owner of the village at the time. The late medieval period saw the development of Lower Town, probably as a result of increasing importance of the settlement and the route through it. 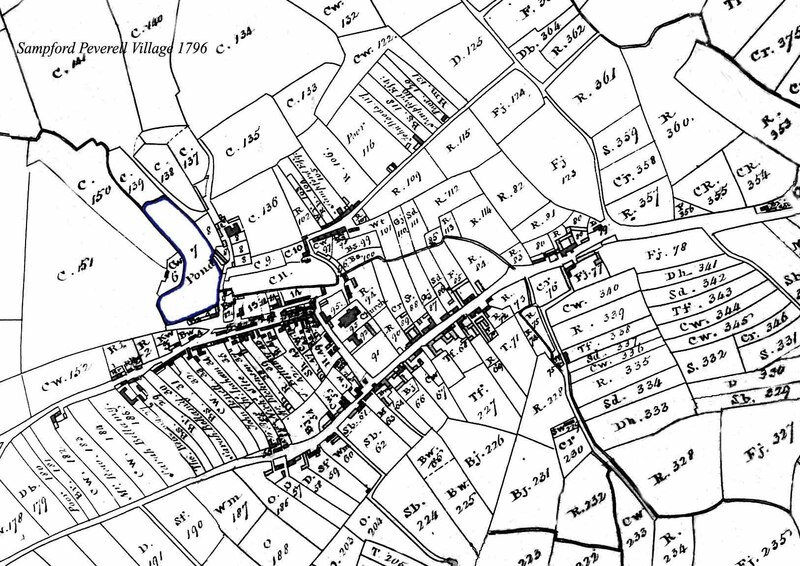 A map of the manor of Sampford Peverell dated 1796 ( see link to map on the Sampford Peverell Society site ) shows the old field boundaries including a large number of medieval strip fields, the massive pond to the western side of Higher Town, and the original settlement pattern prior to the arrival of the canal. In the 18th century Sampford Barton was constructed possibly on the site of an older building, following demolition of Sampford Castle. The Great Pond was drained in the 1950s, but the associated three storey corn mill south of Sampford Barton still exists. In the 18th century Sampford Peverell like many other rural settlements was involved in the woollen industry with much of the work carried out as a cottage industry or in small workshops. Other industrial activity centred on quarrying and lime processing. Evidence of this can be found in the quarries and lime kilns lying to the north at Hill Quarry, Pretty Bench Quarry and on Connigar Hill. There were also tanneries in the village and a lot of small shops and businesses. 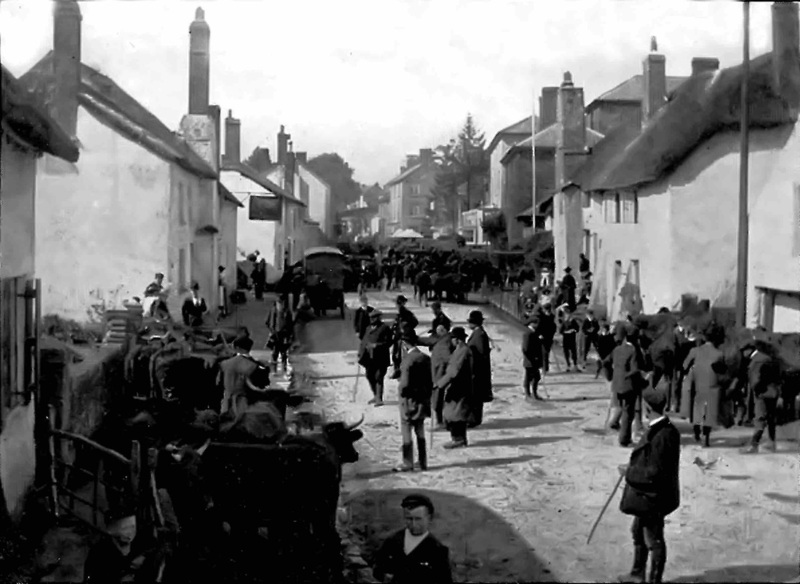 In common with other towns and villages in the locality, Sampford Peverell has a long history of dissenters with records back to the 18th century. In 1802 a Weslyan Methodist Chapel was constructed at Higher Town. It was remodelled and extended in the latter part of the 19th century. The 200 year old building still stands on its elevated site and remains in use as a chapel. A Bible Christian (Baptist) Chapel was also established in Higher Town on the south side of the road. Whilst this building also survives its origins are obscured by conversion and alterations. The arrival of the Grand Western Canal had an impact on the road pattern of the village. It required the construction of a bridge to carry the turnpike road over the canal and further emphasised the separation of Higher Town and Lower Town. Part of the Old Rectory had to be removed and a new rectory was built in compensation. In 1850 The Old Rectory was conveyed to the Minister and church warden for creation of a National School. A new National School building was constructed and opened in 1874 and was extended in the 1890s. The building is still in use as the village primary school. The Sampford Peverell Society has published a booklet on the Church, and another on the childhood memories of Dennis Cluett who lived in the village in the early 1900s. These books are available to buy in the village shop and through the usual retails outlets. The Society is now working on further books about different aspects of Sampford Peverell's history. For more information see the website of the Sampford Peverell Society.